Six13 is a groundbreaking six-man a cappella vocal band that brings an unprecedented style of Jewish music to the stage, with songs ranging from hip hop dance tracks to rock anthems, using only their voices! Sample the music at www.six13.com! Join us prior to the Six13 concert as we gratefully acknowledge Nat and Bea Taubenfeld for six decades (and counting!) of CAI membership and leadership. 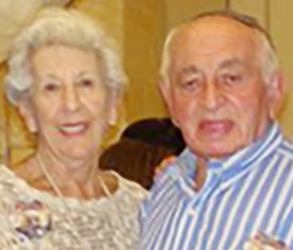 Please complete the form below to register for the Yom Ha'atzmaut concert featuring Six13 and/or the pre-concert reception in honor of Nat and Bea Taubenfeld. Thank you. Are you a member of Congregation Agudath Israel? * Please include the names of all attendees. Make a gift to the CAI Tribute Fund in honor of Nat and Bea Taubenfeld. Please Select One $180 $100 $72 $36 I'd prefer not to make a gift at this time. If you would like to donate a different amount please enter it here.